Our hotelâ€™s swimming beach has walk in access to our lagoon, without climbing over a seawall. You will enjoy the soft white sand that makes up the resortâ€™s beach. There you will find plenty of beach chairs, hammocks and tiki huts with lots of room to spread out. With only 10 cottages the beach is never crowded. Surround yourself in our Florida Keys tropical setting. Our resort grounds are covered with flowering plants. Many varieties of palm trees also grow throughout the hotel grounds. Enjoy the wonderful fragrance of the flowering plants mixed with the warm ocean breezes. Our hotel has only 10 cottages, so there is never a crowd. 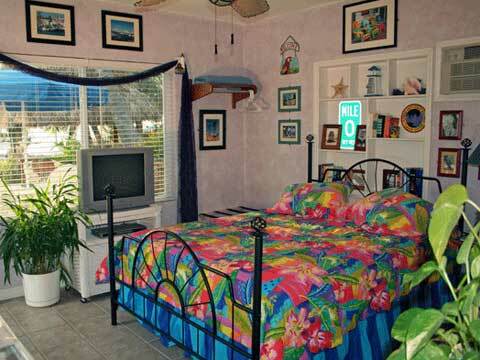 Each resort cottage is uniquely decorated in its own Florida Keys theme. Enjoy your own private wood deck, patio table and BBQ grill. Our rooms are very clean and cozy. Our cottages will put a smile on your face. Our Florida Keys resort is located on the Florida bay. The beach faces the west sky, so our sunsets are spectacular. You will find yourself walking to the beach and dock every evening to witness the ever-changing sunset show. Come to the Island Bay Resort â€“ you wonâ€™t forget it!. Our beach provides easy access into the swimming/snorkeling area. The beach hut and hammock area are perfect shelter from the sun and a great place to relax. Dockage is available for those guests with a boatâ€¦. Just a few steps from your cottage. The Upper Florida Keys is a Mecca of all types of eco adventures. Both state and federal governments have protected our regionâ€™s Eco-system for close to 50 years. You will not find the big city pollution or attitudes in the Upper Keys. Our surrounding waters are clean, clear and alive with all types of wildlife. Our resort is just a few miles from coral reefs and the Everglade National park. Many unique, exciting and educational Eco-adventures can be experienced in our area: -Snorkel or Dive the only coral reef in North America. -Experience the Backcountry on an Eco boat trip -Observe the huge variety of Wildlife & birds -Fish Offshore or backcountry -Kayak the Florida bay, mangroves and the Everglades National Park -Hike trails through the hardwood forests or mangrove wet lands -Photograph an endless variety of tropical animals, plants and landscapes The upper Keys have one of the first protected reefs in the world. Our reef system has been under federal protection since the early 1960s. This means it has abundant life and bio diversity. Thousands of species of fish and coral inhabit our barrier reef system. Most reefs are in shallow waters just 20 to 40 feet deep and they lie only 2 to 5 miles offshore. The Upper Keys reefs are always recognized for their easy diving and snorkeling. They are perfect for both the new and seasoned underwater adventurer. For the more advanced divers, we have several wrecks. Most wrecks are lying just off the reef in deeper waters. Also deeper drift dives can be done over coral fingers in 50 to 90 feet of water. There is something for all levels of diver certification. Your hosts are avid divers with many years of experience. Please feel free to contact Mike or Carol. They will be able to answer your questions. The Florida Keys have some of the most diverse and exciting sport fishing in the world. Three types of sea environments are easily reached from the upper Keys: Deep ocean, Reefs and the Shallow water Flats. You can fish offshore / deep-water species such as Mahi Mahi, Tuna, Wahoo, Shark and Sailfish. Access to the Coral Reef, allows fishing for Grouper, Yellowtail Snapper, and other reef species. The shallow water / flats backcountry fishing is always great for Sea Trout, Snook, Redfish, Permit, Bonefish and Shark. Tarpon fishing is hot, during the late spring / early summer, all around the islands.